A 2018 Flimsy Finish – My Rainbow Regatta! Good afternoon from Muggy South Texas! Yup from freezing to the 70’s. Tomorrow will be shorts! I THINK I am back to normal other than the nagging Flu cough and getting over Sciatica! When my house cleaner quit 2 weeks ago I just was not in the mood to worry about it – and lo and behold – I put a small ad in our small paper and I now have a new house cleaner – Starts on 1 Feb! Good things coming my way! This week I wanted to work on Regatta (one of my January goals) and I did so. I am not sure, but I think this quilt top qualifies as a Modern quilt, something I never thought I would make. But I needed something to get me back to my passion and this was an easy one to do and yet feel the sense of accomplishment! I have been looking at the Regatta quilts being made and I thought, hum, I did not want to make one with the same color family, so I went through my stash and found some Aurora Lights RJR fabric from 2003. I remember so well when I purchased these. We were visiting friends in Georgia, and my friend and I went to a great quilt store and fell in love with the fabrics. At that time I was beginning to applique more and more and wanted to use the gradation fabric for flowers. But alas, the fabrics have been patiently waiting for that to happen and it did not. I moved on to different things such as batiks and now reproduction fabrics. So here is my first finish for 2018 – something to get me started for my 1 February 2018 New Years Day. I cut 2 1/2″ strips of the Aurora Lights and used Nancy Crow by Henry Glass (another one of the fabrics I fell in love with) because I do not purchase a lot of jelly rolls. The original color I had selected did not appear to work out as I had planned. I am so thrilled that I went to my older stash and found the Aurora Lights. I did not want to cut the fabric like the pattern stated and have a lot of waste, so I auditioned each of the 8 pieces of fabric I had in the Aurora’s and selected the border fabric based on the fact that it has all the colors that are in the quilt! I think this quilt would also fall under an RSC Challenge quilt! I am now a Happy Quilter!!!! Have a great week-end. Oh, I am loving your fabric choice and the wide border. Such a happy quilt. Just what is needed to get rid of the winter blues. So glad to hear that you are feeling better too. Maybe the warmer weather will help your back. It was fast and easy and I was so happy that I used that beautiful fabric. Thank you Peggy. Let’s hope February finds us 100%. Pet Sami for me! Well, yes, I am afraid if I get 100% 4 days a week I am happy – that means one day 100 next day 75%, etc. LOL I am not sure what I am saving mine for!!! Thank you Rosanne. I needed to add inches to the width so it was a wide border. I added a little extra Incase the fabric flares or I need to cut it down to square it. One never knows. Have a good evening and thx for commenting. This is a beautiful quilt! The colors are lovely. Glad you are feeling more healthy. I want to come shopping at your house!!! This is exactly the kind of quilt for a gray January day! Hurrah for your first finish of 2018! Yes, a little long on the commute side! 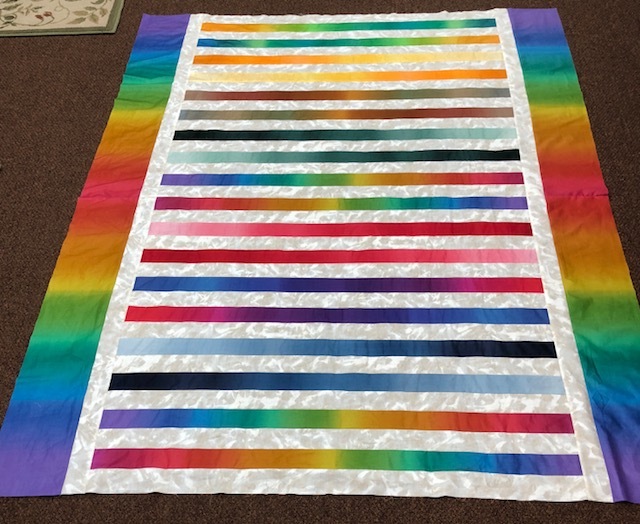 I am not a modern quilter, but I sure love your rainbow quilt! So happy that your are feeling so much better! Thank you Laura, I am definitely not a Modern quilter but I wanted to try to get the spark back in my quilting and I think it helped. It is hanging along with the other 10 or so quilts that need to be quilted! As soon as the stupid SI joint settles down I will be doing the longarm game. That’s a perfect aurora, just glowing. The white on white print seems to add a shimmering quality as well. It’s so timely in this cold drab month. Thanks for sharing it. Your rainbow regatta is so bright and shimmery! I love how the color variations draw the eye all around the quilt top. Thank you so much! Thank you for commenting! Thank you, I love Nancy Crow fabrics. Still have a nice yardage of it for other projects.